Tian is a traditional dish from Provence, and should be made in a clay dish…since I just broke mine, I had to use a Pyrex one. The vegetables are sliced thinly, placed upright and cooked in the oven for a long time. You can add goat cheese as well, but I wanted to keep it vegan and light, so to get additional Mediterranean flavors, I served it with a tapenade tartine. This is a very simple dish to make yet delicious due to the slow cooking of the vegetables and all the herbs that have infused in it. Of course, there are various recipes for tian, some people don’t add onions, but fennel, or potatoes, but tomatoes, zucchini and eggplants should always be around. You can play around with herbs, cheese, etc…but I wanted to keep it simple. Sometimes I like simple flavors and don’t want to add too many intricate and complex flavors into a dish. The slow cooking turned the vegetable almost “confits” in the herbs and own juices. Usually tians are served with grilled meats or fishes, they add wonderful aromas to a dish. I have to admit that I ate the whole tian by myself and was still hungry. Usually this would be sufficient for four, if you serve it with a fish or meat, or also rice in case you want to keep it vegetarian. It really depends on how much vegetables your guests can eat. Quand on aime, on ne compte pas, that’s what the French say, when you love, you don’t count…which is true for many things. The tapenade tartine is a nice element if you want to keep your meal vegan, that olive spread is simply divine with this tian. Spread some olive oil, all over the dish, preferably a clay dish. Place all vegetables upright in the dish, alternating between a slice of tomato, two slices of zucchini (since the zucchini tend to be smaller), one slice of eggplant, and onion. The vegetables need to be tightly arranged so they stand still. Add herbs and garlic, sprinkle with lavender salt and pepper. Add olive oil all over the vegetables. Cover with aluminium foil and cook in a pre heated oven at 365-370 for about 40-45 minutes. Remove the foil and let the vegetables get golden brown. This entry was posted by silvia on July 24, 2010 at 3:04 am, and is filed under Side Dish, Vegan, Vegetables. Follow any responses to this post through RSS 2.0.You can leave a response or trackback from your own site. lovely dish!i made this tian ,is a real delight! So I would have to make the olive tapenade because my sweet husband ADORES olives. I, on the other hand, would be completely content with the tian. The vegetables are so bright and the flavors from the herbs must add such complexity. Beautiful photographs and great recipe! Simple yet delightful! I love the idea of adding a little goat cheese. And combined with your tapenade…Nice! I would like to try it with fresh grill Halibut. Or even just with a crusty sourdough. Beautiful, beautiful dish! Love the inclusion of lavender salt. So sorry you broke your dish. Now I am thinking maybe I better safely keep that dish my husband and I bought together so many years ago!!! As I always said Silvia is my inspiration! See, another delicious looking vegetarian dish on the table. Stacked vegetables! Shall have to try lavender salt. Just came back from France and miss it already, but your beautiful dish only made it worse. Maybe if I make this it will make me feel like I’m back again. Ha ! I just completed my menu for the week and sent the hubby of to the marché , getting caught up on my updates and what do I find a tian Making this for dinner tomorrow night. Love this dish, the key really is to have spectacular ingredients. Beautiful presentation and love the tapenade idea. I love the flavors in this have missed you posting so glad your back! Le tian est un plat que j’ai beaucoup mangé et beaucoup apprécié quand je suis allée en Provence il y a déjà près de 10 ans. Depuis, quand les tomates sont bien goûteuses, je m’en prépare 1… C’est tellement savoureux et avec de la tapenade, ça ne peut qu’être meilleur! It’s so pretty! I always feel a little guilty dipping into a dish this pretty, but I can deal with guilt! I don’t have lavender salt, but I bet I could make some! Wow, this looks good too. I’m so glad to have discovered your site. 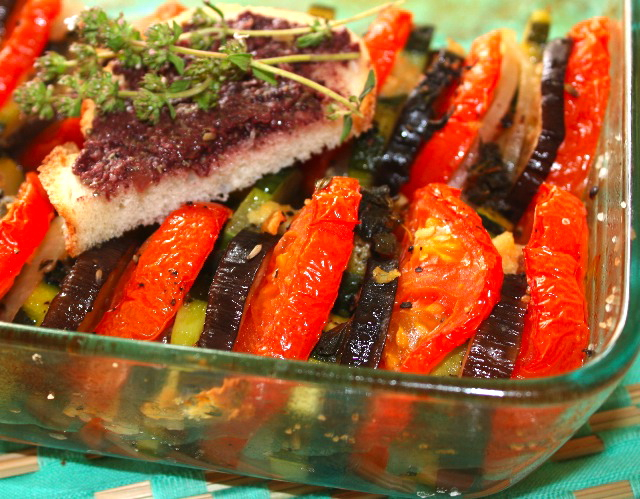 This reminds me of briam or ratatouille, I find the addition of goat cheese intriguing…. Beautiful dish I love the colors and vegetables of Provence. I like this dish exactly the way you prepared it without cheese and with the tapenade tartine, perfection in my book! This is beautiful, Silvia. I really should make more stuff like this-when my organic farmer’s market opens at the end of summer, I will! I would love a plate of this with some whole grain basmati and miso whipped cream-yum! Simple, intricate, or complex this dish is fantastic. The flavors at work here are in balance and harmonious. I love the tapenade recipe with the anchovies, capers, lemon juice, and kalamata olives. Hope you are feeling better my friend! What a wonderful side dish! Your mention of goat cheese made my mouth water. I would love goat cheese with this dish! The tapenade is fabulous too! This looks lovely Silvia. Can you believe I lived for a year in Provence without ever trying this? I’m going to complain to my host mom! Silvia, this is just so beautiful and a perfect summer dish. I have everything in my kitchen but the eggplant – I think I’ll have to pick some up today! How are you feeling these days, btw? Silvia…everytime I’m presented with your dishes…it begs the question…is your personality as colorful and bubbly as these gorgeous preparations? The combined flavours in your Tian are fabulously married. Sorry about your dish…sentimental (especially from Provence) makes it somewhat worse, I really feel it. I love the savory flavors you’ve got on display here. Delightful. Yum! What a perfect meal. This is my ideal summer lunch. And it’s so beautiful! This looks wonderful and so ideal as a summer side dish. I actually have all those vegetables and love the idea of making something light. I may add some goats cheese or mozarella and make this a veggie main meal tonight for dinner served with couscous. Thanks! This is so nice for summer – great flavor, a feeling of nourishment, yet without feeling heavy and full. I love tians, Silvia. But haven’t made one in ages! It’s the perfect dish to serve with grilled meat or fish. Thanks for reminding me how great these are! This is perfect to serve during a summer backyard party, so beautiful to present too. Beautiful and healthy tartine! Lavender salt is an interesting ingredient and i must have this! It makes me think of my mom. I want to make this for her as she usually complains that a non-Asian food is not healthy. Blah Mom. You’re wrong! 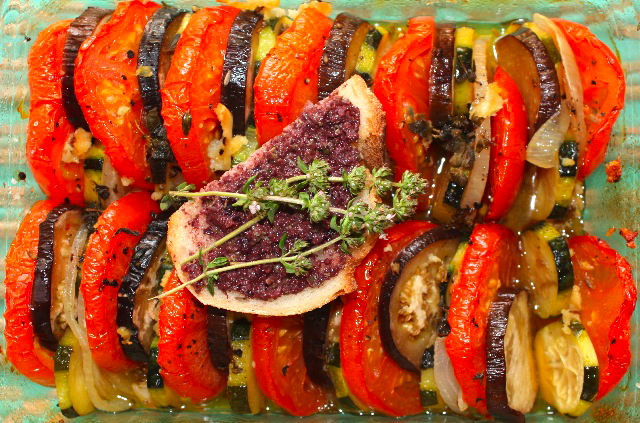 those are beautiful layers and the herbs sound like a melody for my mouth – delicious! Now this is my kind of dish! Simple, homey and surely delicious… I’ve got all the ingredients and will try this today!